The Laikipia Plateau is Kenya’s second largest wildlife refuge after Tsavo and Lewa is the jewel in its crown. It started life as a cattle ranch but became a non-profit making wildlife conservancy in 1983. Set in full view of Mt Kenya its 263 sq km of rolling golden grassland and iconic flat-topped thorn trees provide a glorious setting in which to track down the Big Five. If you want to see rhinos you can’t fail at Lewa. At least 65 black and 45 white rhinos roam freely here under tight security along with cheetahs, wild dogs and the world’s largest single population of the endangered Grevy’s zebra. Another Lewa special is the sitatunga, a rare swamp-dwelling antelope introduced from Saiwa Swamp, the only other place in Kenya where it is found. If you are thinking of heading up-country to Meru or Samburu I would strongly recommend Lewa as the perfect add-on. Lewa Wildlife Conservancy is the original, and probably the show piece, conservancy on the Laikipia plateau. A favourite of the jet-set and visiting British Royalty this is where conservation, business and community development really works. The setting, below the snows of Mt Kenya, is classic East African savannah pock marked with yellow barked acacia trees and home to a huge array of wildlife including all the Big Five, which you’re almost guaranteed to see. Personally I love almost everything about Lewa and I have so many fond memories of the place. Seeing how Lewa is a private conservancy there are opportunities here to partake in activities that would be impossible in the national parks. I once spent a memorable morning with a ranger tracking radio-collared lions. We pinned our group down to an area of very fairly dense thorny scrub woodland that was so rough and rocky the jeep couldn’t advance any further. The ranger knew the lions were within 20 metres or so of us but we just couldn’t see them, so he hopped out of the jeep and instructed me to do the same and then on foot we gingerly (me considerably more gingerly than him) popped our heads around the side of trees looking for them! Lewa is also where I had the most exciting bush walk I have ever done. For those who’ve not done a bush walk before you need to know that it’s rare to ever see more than perhaps a fleeing dik-dik but on this particular morning we found ourselves hemmed into a tight valley by groups of elephants on all sides. We climbed a small hill to move away from them and as we reached the top so too did a group of female elephants with young. They were no more than twenty-five metres away and I remember asking my Maasai guide what we should do if they charged. He looked around and said “We’ll move up that hill”. I looked to where he was pointing and said “What? That one over there with all the buffalo on it?”. Visiting Lewa is very expensive (you have to be a guest of one of the handful of very small and exclusive lodges) but if you can possibly afford it don’t miss the opportunity to experience this wonderful slice of East Africa. Lewa Wildlife Conservancy is a brilliant place to indulge in some fine accommodation and see some of Africa’s most coveted wildlife. It’s the kind of place where you go to bed to find a hot water bottle strategically placed under the covers, and fresh brewed coffee by your bedside in the morning. The landscape is a collection of huge, whaleback hills covered in grassland, and, for the most part, dead acacia trees – the elephants are destructive around here. Big, open, rolling savannah country stretches over hills, dipping into valleys. There are also pockets of fever trees. Mt Kenya pokes its nose above the horizon in the distance. This is undoubtedly one of the best places in Africa to see black rhino. Not only does the conservancy have a good number of these critically endangered creatures but they are well protected and that sense of security must have pervaded their brains, as they are easily viewed. But the highlight for me was following two cheetah (brothers) stalking the evening shadows. We got really close to them, they didn’t seem bothered at all, hardly affording us a glance as they surveyed the landscape for their next meal. I also saw lions take down a baby giraffe, Grevy zebra, Grant’s gazelle, buffalo wallowing in a mud bath, elephants and many birds, especially vultures. Lewa was a fantastic wildlife viewing experience with very knowledgeable guides. 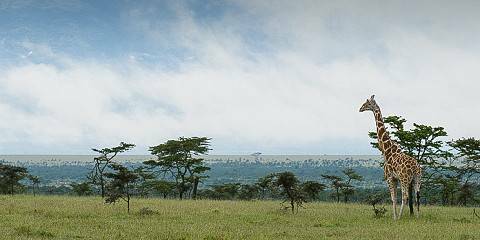 Lewa is an intriguing and unique safari experience. Visitors will not only get to see a host of endangered wildlife species and enjoy high-quality game viewing from a choice of fine safari lodges, but they will also be exposed to a highly successful conservation project at the very forefront of East African conservation. 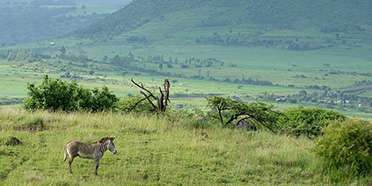 Lewa at a paltry 250 square kilometres is – by African standards – a small and intensively managed conservation area. The presence of a number of internal management fences and legal cattle grazing inside this fenced reserve are not everyone’s cup of tea, but Lewa is also Kenya’s foremost black rhino sanctuary. Aside from the endangered East African black rhino and Grevy’s zebra, Lewa is home to the full suite of Big Five and plains game species, with reliable and top quality sightings all but guaranteed. But what makes the wildlife-rich Lewa so unique and attractive is that this private reserve is probably the most well resourced and well-protected conservation area in all of East Africa. Lewa is at the very forefront of Kenyan conservation, intimately involving its surrounding communities and with the Northern Rangelands Trust, ensuring that it has positive conservation impact well beyond its boundaries. Lewa is a privately-run, non-profit conservancy in northern Kenya, set up in 1983 by cattle ranch owners dedicated to wildlife conservation. It’s first and foremost a black, and white, rhino sanctuary and numbers here are simply staggering – I saw several of each species in a single afternoon’s game drive. Plus I spotted plenty of elephant in the yellow fever tree woodlands, herds of the endangered Grevy's zebra on the grassy plains, and watched a female lion and her two cubs drinking on the edge of a reedy swamp at the same time as a pair of brave sitatunga waded in the shallows. But the highlight for me was my incredibly informative Maasai guide, who not only knew about the animals but proudly told me about the conservancy’s success – today’s Lewa is considered a leading example of sustainable tourism, re-investing all profits back into projects that support wildlife and community development. There are five expertly hosted places to stay, and along with day and night drives, horse-riding and walking, Lewa offers the full package for wildlife and conservation-lovers. Lewa Wildlife Conservancy lies just beyond Laikipia’s official boundaries, but this is still a flagship reserve for the Laikipia model. Luxury lodges and tented camps stand in blissful isolation, while sightings of the Big Five in a single day are a very real possibility. I saw more rhinos on my initial crossing of the conservancy than I had seen in a year of wildlife-watching elsewhere, and the lions and elephants, too, were easy to find. Expert guides get you off road, up close and personal – I could have reached out of my vehicle to touch rhinos and elephants, was charged by a baby rhino and its mum, and a Somali ostrich sped past, all before breakfast. Lewa is also classic East African savannah country and large enough to mean that there are ample opportunities for feeling like the clamour of Kenya is a world away. Activities include horse-riding, a rhino orphanage, village visits and scenic flights. One of the oldest reserves on the Laikipia Plateau, Lewa has been the home of the Craig family since 1924, initially as a cattle ranch, but since 1983 as a non profit private wildlife sanctuary, the proceeds of which are either pumped back into conservation, or diverted to local community projects and economic development. We visited it in an unusually wet rainy season, when road access to serval parts of the reserve were restricted, but even so we found the setting of craggy hills to be lovely, and the game viewing exceptional. We enjoyed great sightings of black and white rhino, lion, elephant and buffalo, as well as the localised Grevy’s zebra (Lewa’s estimated 4-500 individuals represents 15-20 percent of the global population of this endangered equid). An important attribute of this reserve is that, in addition to the usual daytime game drives, it offers a choice of guided game walks, expertly guided horseback rides, and night drives. Lewa is one of the private ranches on the Laikipia Plateau. This property is particularly scenic. My favorites are the yellow fever tree forest and a big swamp area, home to the very rare sitatunga antelope. Rolling hills offer good views over the plains and on a clear day Mount Kenya sticks its head out. All the big five can be seen, but the black and white rhinos, which are rarely seen in Kenya’s National parks and reserves, are the real specialty in Laikipia. Lewa is also home to a high number of the endangered Grevy’s zebra. Staying at Lewa House is like a colonial home stay. Meals are elaborate, homely affairs. Bush breakfasts, horse riding and sundowners all add to the overall feeling of colonial opulence. I was made to feel like a visiting friend. 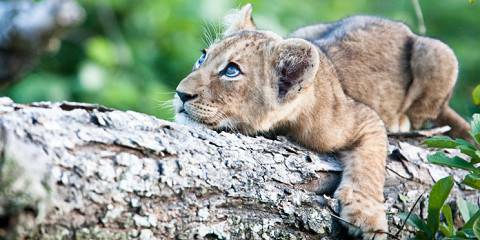 Unfortunately, the game viewing circuit isn’t very big and game drives are kept rather short. Lewa is justly famous for its great herds of rhino but it is the magnificent views of the nearby peak of Mount Kenya that stick in the mind just as much as the gigantic herbivores. I rode into Lewa (on an extremely fast one-eyed polo pony) at the end of a five day horseback safari across the flanks of Mount Kenya. The rhinos were an impressive sight – seemingly oblivious to our presence – and we galloped with lolloping giraffes and among a herd of Grevy’s zebra (rarely seen elsewhere). A safari this high up the mountain offers some pleasant experiences that most people don’t often associate with Africa: it is chilly here at night and the pleasure of sitting around a log fire and drifting off under thick, cosy blankets with the sounds of the African night outside is memorable. 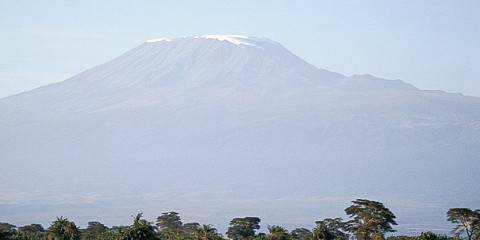 As are the misty dawns with the great peak of My Kenya just beginning to raise its jagged head.